Bayside Trail. A quick easy hike with amazing views across San Diego Bay. 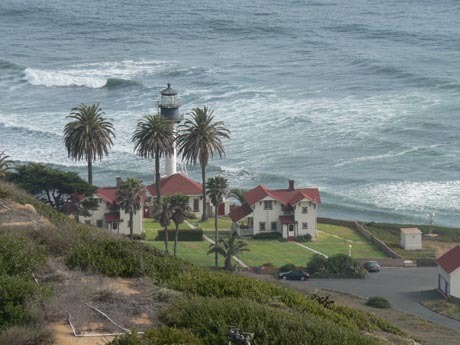 First, visit Cabrillo National Monument which commemorates the area at the southern end of Point Loma where the first Europeans landed at San Diego Bay in 1542. Convenient to city urban area. Great San Diego weather. Cool ocean breeze and some of the most outstanding scenes you will ever experience. The trail can't be missed from the visitor's center as it descends down the eastern slope of the point down to San Diego Bay. Bayside Hiking Trail is about 2-miles long on the clearly marked trail that was once an old army/ navy road. The entire loop should take about 1.5 hours to complete. The glimpses of sailboats and other ocean-going vessels is an experience of tranquility. Getting to the trailhead. From Interstate 5 south in San Diego take the Sea World Drive Exit heading southwest toward Tecolote Road. Turn right onto Sea World Drive - stay straight to go onto Sunset Cliffs Blvd. Take a slight left onto Nimitz Blvd. Turn right onto Chatsworth Blvd. Turn left onto Catalina Blvd. Catalina Blvd. becomes Cabrillo Memorial Dr.